These settings do not specify actual hardware, however, VMM uses these settings to calculate host ratings and to set CPU resource allocation. 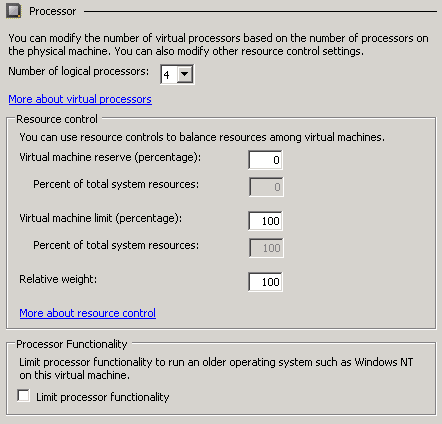 VMM, not Hyper-V, uses that CPU type for something, but it does not sound like resource management of running VMs. I suspect this is limited to the intelligent placement feature, the one-time recommendation of a host when provisioning or migrating a VM. 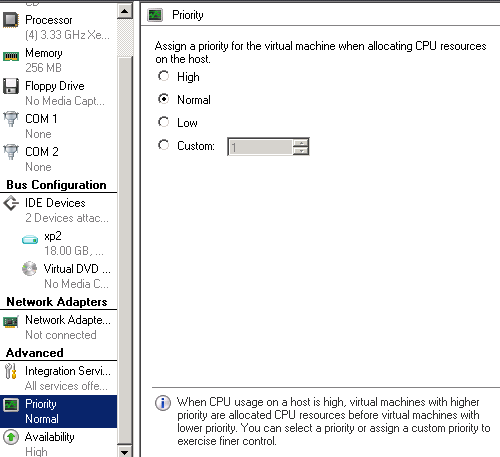 The Priority option looks like CPU shares on VMware ESX — a means of specifying which VMs will receive priority when there is contention for resources. As far as I can tell, there are no more CPU resource settings available in SCVMM. Not only do VMware VI3 administrators have a single client for managing all aspects of their hosts and virtual machines, they have something else: resource pools. Why manage resources for individual machines when you can place them in containers that partition CPU and memory from an entire hypervisor farm? No experienced administrator would make a practice of applying permissions to individual user accounts instead of a group. That doesn’t scale and just increases your OpEx. Why not expect the same maturity in your VM resource management? The absents of CPU reservations and limits from SCVMM is just another example of the lack of communication between the Hyper-V team and the SCVMM team. I look forward to seeing the next revision from MS, maybe that will be closer to the target.